The damaged rest room at Arleta and San Bruno. Our City is NOT prepared for any major catastrophe and one of the ways one can gauge the Department of Public Works for example is monitoring their poor performance from the time one calls in a work order. The same can be said about MUNI and all the waste of money. 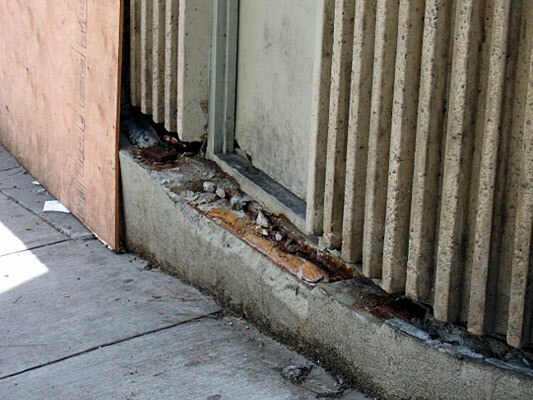 I am very familiar with small construction jobs, the breakage of a clean water or sewage pipe, a damage rest room - as in the case of the one at Arleta Street and San Bruno by the Seven Eleven. This spot by the Seven Eleven is an important spot where a number of buses both those that ply within the City and County of San Francisco and those that take you to South San Francisco and the Airport all converge. Many passengers wait and wait for their favorite bus. The rest room is damaged and looks like is may topple on to the road and God forbid should the incident hurt some one. This has been the case for over two months and no one is really addressing the situation as it ought to be addressed. 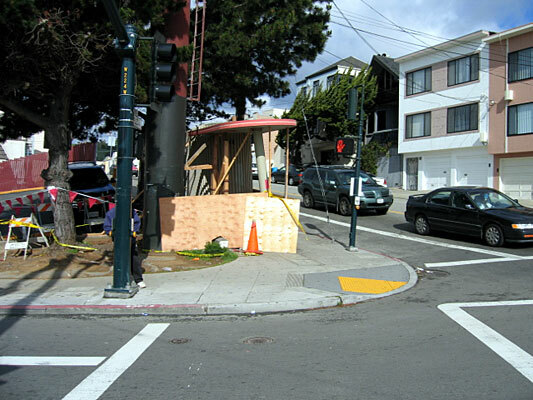 A MUNI bus rammed into the concrete bus stop some months ago and completely dislodged it from the foundation. Since I brought this to the notice of the Department of Public Works even though it is a MUNI restroom - I was given insurance on Channel 26 and 78 that something would be done to address the dire situation. Now every day according to the MUNI inspector some one come takes photographs, others go round the damaged rest room and simply gaze at it for many minutes. This ritual has been going on for weeks now. Some days ago a few men came and propped up the damaged concrete built rest room with some cheap two by fours and ply wood and this sort of tells the world keep away from this area. The paradox the homeless take refuge in it and I even saw a woman store some bottles and cans with the intention to coming later and retrieving the contains. I wonder if the dumb, stupid, ignorant, and very arrogant Sophie Maxwell has visited the damaged concrete MUNI rest room. If her dumb aides Greg Assay and Sarah He have - they are busy concocting faulty legislation, never return calls, and are there to serve the whims and fancy of the woman Caligula that they serve. MUNI has just completed a $650 million dollar MUNI 3rd Street Lightrail but does not have the decency the address this rest room that can topple and kill some one. Once this happens MUNI will shell out millions as it has done again and again in the past. In front of this damaged structure is a small round sewer cap that is missing. This open sink hole is dangerous as so many wait for the bus at this busy bus stop by Arleta Street and San Bruno. No one cares if some one trips and falls. Once I saw a woman with high heels get one of her hills caught ­ she was young enough to draw her leg sans the shoe and retain her balance. She was embarrassed as every one was looking but glad I hope that she did not sprain her ankle or fall on her face. We now have a new Director of DPW I am told. We also a new MUNI Director in Nathaniel Ford - both these guys can visit the site and decide if this perilous site is indeed what I portray it to be. Let us see how many months it takes to fix this mess. In the interim a portable toilet sits on the ground and occupies what little space is left for the passengers to wait before they catch the bus of their choice. MUNI does not give a damn nor does DPW if it rains and the people have to suffer. They do not give a damn about the many Seniors, the disabled, others that take Public Transportation weather the elements. All most of them care for are the big bucks they make, the hot air they produce, and the next to nothing work that they put in every single day. The DPW engineer that promised to do the job should be fired. This is a Health and Safety issue and should be given top priority. 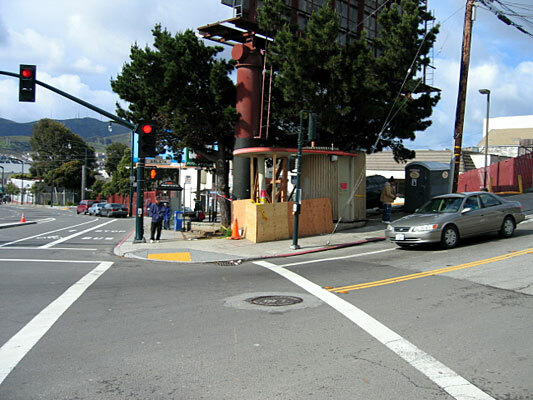 But these vermin - most of who do not live in the City ­ come here to make their money and not to work and serve the City and County of San Francisco. Another angle of the rest room. Knocked off its foundation and dangerous.